While most students last week were studying late for final exams, 32 University of Virginia engineering students were staying up late for a different reason: They were testing miniature cars in preparation for an autonomous vehicle race that was their final exam. The students were in computer science professor Madhur Behl’s special topics class in F1/10 Autonomous Racing, combining computer science with systems engineering using 1/10th scale model Formula 1 cars. During the semester, Behl’s students built, drove and ultimately raced the autonomous cars while learning about the principles of perception, planning and control for self-driving vehicles. They learned to use the same hardware and algorithms employed in full-size autonomous cars being developed by the automotive industry. 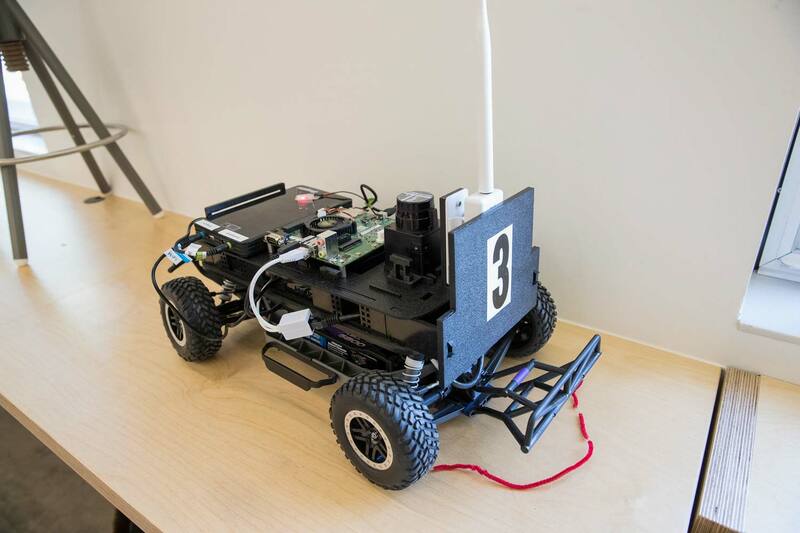 As he spoke, a competing team’s autonomous car was whirring around a portable race track set up in the “arena” of UVA School of Engineering and Applied Science’s Link Lab, a new $4.8 million, 17,000-square-foot facility where researchers and students from a range of disciplines connect to work on engineering problems. Eight teams ran fully autonomous F1/10 cars, under timing, in sequence, in the race dubbed by Behl as “The Battle of Algorithms.” All teams built cars using similar hardware, so the way to race faster was to outsmart the other autonomous drivers through better algorithm design – the path-planning, steering and acceleration control calculations programmed by the students into the software aboard their cars. The goal for each four-member team was to successfully, and quickly, run their cars in laps around the track without crashing. When constructed and programmed competently, the cars use a range of sensors and cameras to detect the surroundings and navigate safely while making turns that follow the course. Some of Behl’s students likely will go on to careers in autonomous car development, which is considered the wave of the relatively near future by many in the automotive industry, with two dozen companies around the world actively doing research and development. The work involves programming and “machine learning” – training cars to learn a sense of space and to “behave,” so to speak, appropriately in the range of scenarios that human drivers face daily on highways and roads. That is exactly her professor’s objective. Behl said his course – which brings autonomy and autonomous vehicles from the lab to the classroom – is one of the first of its kind in the nation. His students learned to use the Robot Operating System, a program that runs algorithms for collecting data from “perception” sensors on a vehicle, planning the route the car follows and issuing commands for steering and braking – the same system currently used by companies on full-sized self-driving cars. The perception sensors include multiple cameras, laser range finders called LIDARs, radar, GPS and others. His course material is free and open-sourced (available at f1tenth.org), and used, he said, by dozens of universities around the world to build 1/10 autonomous cars.